Take a look around you: How many plastics do you see? The cup you’re drinking out of? The device in your hands or the mouse you’re using? How about the pipes that are in your walls carrying water to its destination? The pipes that run through your walls are probably made up of polyvinyl chloride (PVC). PVC is the third most-produced plastic in the world, behind polyethylene (plastic bags) and polypropylene (a wide range of packaging materials). PVC pipes are the modern replacement for copper pipes in residential and commercial properties. They’re lighter, less expensive, easier to work with, and usually regarded as safe for consumers. 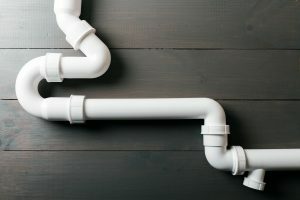 Many of us have never thought much about these ubiquitous white pipes. They are sturdy and can generally stand up to decades of use. But this application is only one of the many ways we use PVC. With a plasticizer, PVC can be made into flexible materials, which can be used in a wide range of products: cable insulation, swimming pool liners, inflatable toys, rubber boots, and much more. Since PVC is so common, failure is going to happen. When a failure occurs, the material itself is often put under scrutiny. However, the failure may have been caused by a human or environmental issue, independent of the material itself. When we are performing chemical and physical testing to determine the exact cause of a failure, we test a wide range of possible reasons why the material might have failed. Incorporating a plasticizer as an additive to change the properties of the substance in order to make it suitable for different applications could possibly cause a failure. Across the many uses for PVC, the content can be too high or low. If this happens, it may not perform for its intended application. Here at SGS PSI, we can test for this discrepancy and identify if this is a potential cause of failure. A failure can also occur if an outside chemical comes into contact with the material. We can employ chromatographic techniques to look for the presence of a solvent or other chemical that could cause a failure. PVC can fail in many physical ways as well. Exposure to the elements and sunlight can degrade materials and cause the material to fail prematurely. Water itself can cause damage within the pipes–often by freezing in winter or when the wrong size tubing is used and the water velocity exceeds the specifications of the material. PVC is susceptible to temperature changes that can cause failure before the end of its normal lifespan. We can employ thermal analysis to observe changes in crystallinity that occurred as temperatures changed within the material. If there are changes, we can deduce whether or not they factored into the failure. With all the ways this material can fail, it’s important for testing labs to have staff who are experienced in the full range of testing required for PVC. At SGS PSI, we’re not only experienced in those testing methods, but also in building custom testing environments to simulate what the material experienced in the real world. 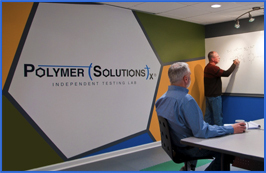 We get excited every day by the possibilities that polymers present to us for testing. Over the years, we have tested items ranging from carpet to tires to medical devices. If you’re looking for an independent testing lab with many years of experience in failure analysis, get in touch today.